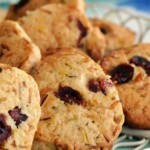 Easter Biscuits are a British food recipe of cookies with currents. Cream the butter and sugar together until pale and fluffy. Beat in egg yolk. Sift in the flour and spices and mix well. Add the currants and orange and lemon peel and enough milk to form a soft dough. Turn dough onto a floured surface and knead gently. Roll out to about ½ inch thickness. Cut into 2 inch circles (use a cookie cutter or the rim of a small drinking glass). Prick the tops with a fork. 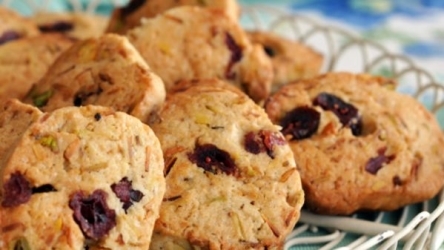 Put biscuits onto two greased baking sheets. Bake for 10 minutes. Remove from oven. Brush with lightly beaten egg white, sprinkle with sugar, and return to oven. Bake for about 5 minutes longer, until the tops are golden brown. Transfer to wire racks to cool.